A couple of good snapper from the upper South Island. In snapper fishing tide and time really matter. 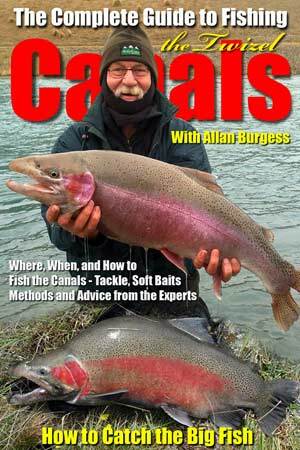 Having spent most of my fishing years in Canterbury fishing for trout and salmon I wouldn’t pretend to be a great snapper fisherman. After all, we generally don’t get many snapper in Canterbury. Back in the day, I would catch a few in the Marlborough Sounds on jigs while fishing in deepwater from boats but that was about it. When snapper fishing from shore tide and time of day make a big difference. As does the time of year. When I was in the Canterbury Sports Fishing Club there were a few anglers who would travel to the Sounds and regularly catch big snapper up to 24 lbs in quite shallow water. By shallow, I mean as little as a metre deep while fishing from small boats over the mud flats near Havelock. From my observations, at the time it seemed to me that the same guys would catch most of the snapper while everyone else was mostly wasting their time. 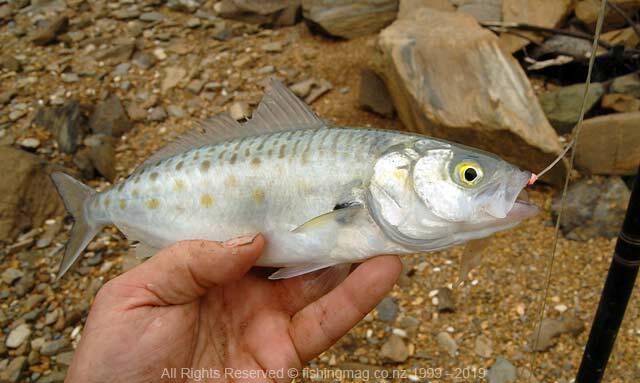 With a bit more time on my hands in recent years, I’ve had the chance to suss out quite a bit more about how to catch these wily fish surfcasting in Nelson and Marlborough. Another very good spot with easy access is the Mapua Inlet. Snapper move right in close to shore to feed over the extensive mud flats. Areas that don’t seem particularly productive on a bright sunny day suddenly become productive for snapper fishing when the tide is in and the sun starts to disappear below the horizon. During the day a small group of “experts” would paddle out to sea in their kayaks from places like Ruby Bay and return with snapper. They would actually paddle out quite a distance from shore. They went so far out it was almost impossible to spot them without the aid of binoculars. The snapper they brought back weren’t big double figure fish but they were certainly easily legal size. My question was couldn’t these fish be caught from shore! The answer is definitely yes. 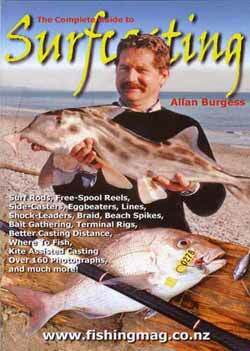 You can still catch snapper with surfcasting gear from shore in Nelson and Marlborough but you need to learn a few “secrets” first. To begin with, the water in Canterbury close to shore is never clear. It is always green and murky. Whereas in Nelson and Marlborough the sea is usually clear and you can see the bottom most of the time even in quite deep water. Snapper is a cautious fish especially when the water is clear. For this reason, you are so much more likely to catch them close in during the change of light early morning and late evening. 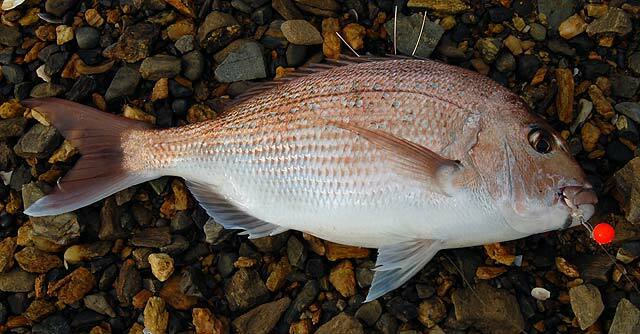 The stage of the tide is an important factor when it comes to shore fishing for snapper. In the Marlborough Sounds, especially, the state of the tide is particularly important. 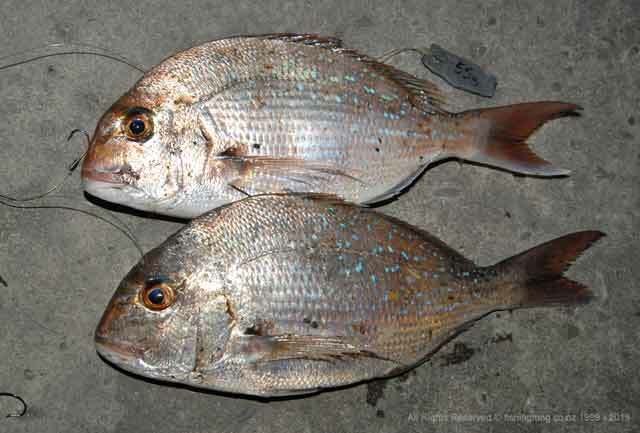 School snapper will hunt over mud flats and in shallow bays but they generally don’t in bright sunlight. You can fish a particular spot all day without success then all of a sudden as the light fades and the tide is all the way in the snapper will start to bite! This snapper was caught on surfcasting gear in the Marlborough Sounds. Note the small orange float used to keep the bait off the bottom and away fromj crabs. Bait and hook size also matters. Perhaps surprisingly I have been the most successful with squid. It holds on the hook quite well and works better than just about anything else including the freshest yellow-eyed mullet. Piper or garfish makes good snapper bait but is very good to eat cooked whole in a pan, floured, and cooked in butter. Often the best places to catch school snapper – say 35cm in length – are the same areas that attract all manner of baitfish including bait pinching spotties. They can make bait fishing for snapper a real pain by constantly stealing your bait. Bait elastic helps to slow down the feasting spotties but not by a lot. You need to check your hooks often to ensure you still have bait left on them. I use a simple two-hook Paternoster or Ledger rig for snapper fishing. I change the hooks to a suicide pattern and snell them to the droppers. Use 50lb monofilament for both backbone and droppers. If fishing over foul ground a spoon sinker is a better option as it is less likely to get caught in the rocks. As for hook size, I use 2/0 to 4/0 tied on a simple two hook dropper rig. It works for me. I prefer to snell my hooks on to 40lb or 50lb monofilament. Snapper have very strong teeth designed to crush crabs and shellfish so you don’t want to be using lines they can easily bite through. Depending on where you are fishing it is also good insurance to tie on your sinker with some sort of weak link like using lighter monofilament. If your sinker gets caught in rocks there is a good chance you will still be able to land your fish. Flat sinkers like the one shown in the picture at the top of the page tend to plane up quickly towards the surface and are less likely to become snagged on the bottom. The only downside with these is that you give up a bit of casting distance. One thing I have noticed about snapper fishing is that there might be quite a few anglers fishing and no one is catching snapper. Then suddenly they come on the bite. You have to be prepared by casting out fresh bait and checking your rig at regular intervals, say every 10-15 minutes. Perhaps a school just happens by, I don’t know, long pauses in the action are not unusual when it comes to snapper fishing. Some anglers use lightly weighted stray-line rigs designed to cast the whole baitfish when targeting big snapper from shore. 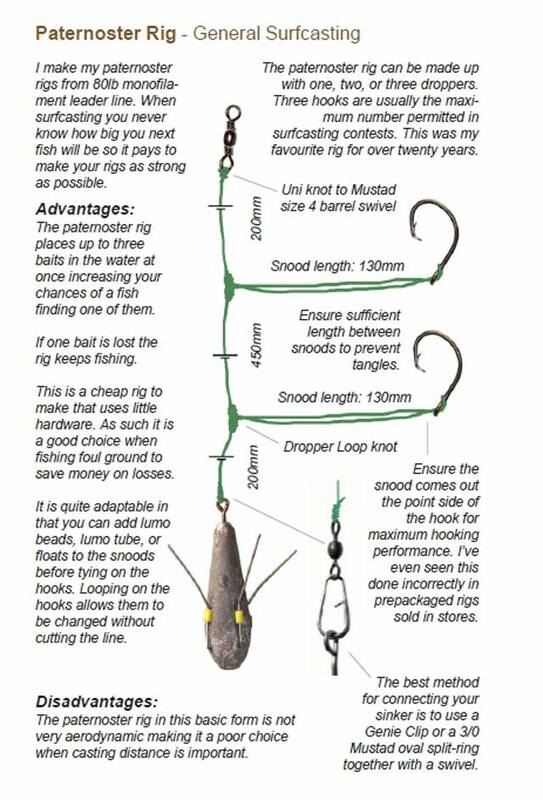 A fixed hook at the bottom is augmented with a second sliding hook above it and a small sinker is added to aid casting and take the bait down to the bottom. The Stray-Line and Running Sinker rigs are used more for big snapper. So far I have found the Dropper or Ledger rig to work fine on snapper that measures around 35cm in length. Juvenile kahawai typical of the size found in Nelson bays and inlets as well as the Marlborough Sounds. Finally, berley makes a big difference when shore fish. Though berley isn’t strictly necessary when snapper fishing from shore it can make a big difference to your catch rate. This is especially true when fishing from rocks or a jetty. The berley trail brings fish in from far and wide. Provided you keep your berley trail going it also acts to hold schooling snapper in your fishing area. Though in many areas berley also attracts those pesky spotties! Nelson/Marlborough are in the Challenger Region. 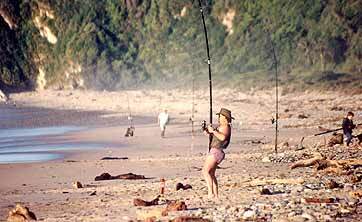 Check the Recreational Fishing Rules before you go fishing on the Ministry for Primary Industries website. 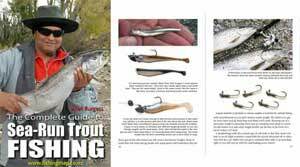 It is a very good idea to download the Fishing Rules brochure for the area you will be fishing and take it with you when you go fishing. You must also have a ruler or measuring tape with you so that you can check that any fish you want to keep are of legal size. Note that there can be different rules within the same region. For example in the Marlborough Sounds the bag limit is 3 snapper, while in Nelson it is 10. 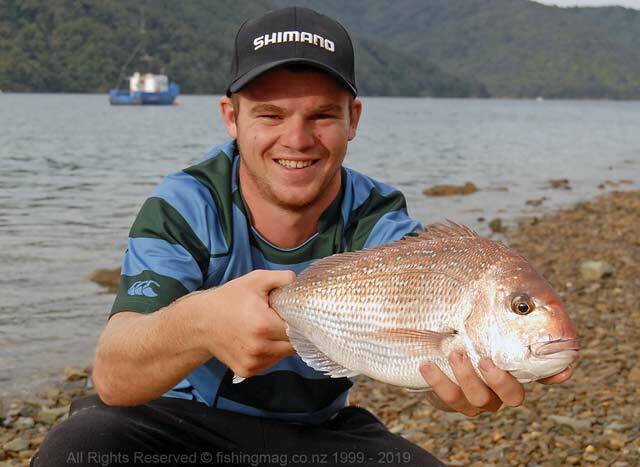 A good size eating snapper caught on surfcasting tackle in the inner Marlborough Sounds by a very good young angler. The state of the tide, time of day, and time of year all play an important part when it comes to successful snapper fishing from shore.